Human beings love to fictionalize evil--to terrorize each other with stories of defilement, horror, excruciating pain, and divine retribution. Beneath the surface of bewitchment and half-sick amusement, however, lies the realization that evil is real and that people must find a way to face and overcome it. What we require, Carl Jung suggested, is a morality of evil--a carefully thought out plan by which to manage the evil in ourselves, in others, and in whatever deities we posit. 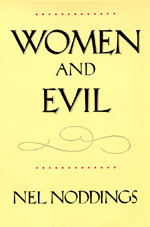 This book is not written from a Jungian perspective, but it is nonetheless an attempt to describe a morality of evil. One suspects that descriptions of evil and the so-called problem of evil have been thoroughly suffused with male interests and conditioned by masculine experience. This result could hardly have been avoided in a sexist culture, and recognizing the truth of such a claim does not commit us to condemn every male philosopher and theologian who has written on the problem. It suggests, rather, that we may get a clearer view of evil if we take a different standpoint. The standpoint I take here will be that of women; that is, I will attempt to describe evil from the perspective of women's experience. Noddings received a bachelor's degree in mathematics and physical science from Montclair State College in New Jersey, a masters degree in mathematics from Rutgers University, and a Ph.D. in education from the Stanford Graduate School of Education. Nel Noddings worked in many areas of the education system. She spent seventeen years as an elementary and high school mathematics teacher and school administrator, before earning her PhD and beginning work as an academic in the fields of philosophy of education, theory of education and ethics, specifically moral education and ethics of care. She became a member of the Stanford faculty in 1977, and was the Jacks Professor of Child Education from 1992 until 1998. While at Stanford University she received awards for teaching excellence in 1981, 1982 and 1997, and was the associate dean or acting dean of the School of Education for four years. After leaving Stanford University, she held positions at Columbia University and Colgate University. She is past president of the Philosophy of Education Society and the John Dewey Society. In 2002-2003 she held the John W. Porter Chair in Urban Education at Eastern Michigan University. She has been Lee L. Jacks Professor of Education, Emerita, at Stanford University since she retired in 1998.